Congratulations to Kachumbala Area Cooperative Enterprise (KACE) Community Library in Eastern Uganda, which has received a grant to expand its innovative farmer-to-farmer information service. The service was initiated in 2012 with support from EIFL’s Public Library Innovation Programme (EIFL-PLIP). 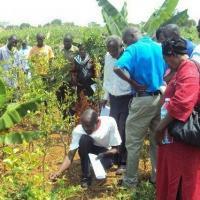 Through the EIFL-PLIP grant, KACE reached out to farmers through 15 cooperatives in Bukedea district. The library trained 30 farmers to use digital cameras and tape recorders to collect information from farmers engaged in agro-ecological farming methods. The farmers also learnt to use computers to create PowerPoint presentations in the local language Ateso, and shared the presentations through 15 documentary screenings, attracting 500 farmers. The new grant from the UK-based non-governmental organization, Build Africa, supports a three-year livelihood project in Bukedea district. The livelihood project aims to improve farmers’ income, and will enable the library to extend the farmer-to-farmer information service to include more farmers and to build their business skills. According to Mr Charles Okubal, KACE chairperson, the funding will be used to purchase additional computers, to cover the costs of the library’s internet connection, and to train farmers to research the internet for market prices and to market their produce online.